From pre-season to post-season, team leaders have the responsibility to put the team in the best position to improve and achieve their goals. Being a team leader can be extremely rewarding, but also at times frustrating. Coaches and captains often struggle with the balance of influence on their respective squads. Coaches, especially, can at times find themselves lacking specific way to influence the team when they aren’t able to play on the field or lead by example. How often do these positions shape the team’s identity? Indeed, how much can these leaders even make an impact? Finding specific and targeted ways to tweak a group’s strengths, weaknesses, and progress is a necessary battle, but also a delicate dance. Not everyone likes a coach that dominates every decision on the field; yet the hands-off coach can be even worse, letting the players stumble time and again. In reality, there are several clear and important methods that coaches and captains can employ to impact their teams through the pre-season, during the tournament regular season runs, and after a season concludes. Find the best way to make your presence felt and make the positive changes that are needed for your squad. The pre-season is the time when the captain can do the most to influence a team, guiding the ship, charting the course, selecting the crew, and training them to be ready for whatever storm blows their way. The best way to shape a team as a leader is to be the one helping to put it together. It is important not to just go in with the classic (and incorrect) attitude of taking the 25 or so “best” players. Instead, each player’s abilities need to be evaluated and quantified as specifically as possible, their work ethic and cooperation need to be described, and they need to find a slotted role (no matter how much of a superstar they might be thought to be). First, are any positions on the roster locked? Why or why not? Evaluate the team’s strengths and weaknesses. Where do you need to improve? Break it down by defense and offense, and by position. What do you need most? Who is willing to commit to the team’s program identity and schedule? Who can work best with the chemistry and leadership that the team has put together? Which players will have the mental toughness in critical situations? Think carefully even now about lines that will work well together on the field. Selecting with specific detail is the best way to make an impact. The chess match begins with selecting the pieces before you begin to help them play the elaborate game. Perhaps the best way a team defines itself (other than the players and personalities that make it up) is what it does, and that is almost entirely in the powers of the leadership group. The difference between a team that practices twice a month and one that practices three times a week is noticeable. Likewise, workouts can build your team’s abilities and mold them into their best selves, so have an accountability system, a team workout plan, and a clear communication and buy-in for the squad. Even more importantly, what’s done at practice and what’s focused on in playing time is the best way to influence a squad. First, know the keys to running a good practice and avoiding time-wasting. Then take those same evaluating questions from roster selection and start guiding the team toward improving itself with specific and purposeful planning. Tournament scheduling is an underrated aspect of leadership. Playing the regular season right, especially if you searching for bids, is best done through a specific lens. Too often, players want to jump for the top tournaments, regardless of time, location, or ability. Scheduling takes into account a lot of factors, including finances, competition level, travel distance, and more. Plan for a tournament schedule that will challenge your team and help it to improve, but also allows it the opportunity to win some games. Factor in costs and time so that the regular practice schedule has minimal disruption and the burden is minimal for the players. If practice planning and tournament scheduling are the minutiae of team leadership, then offensive and defensive set planning is the big-picture. Think about those strengths and weaknesses again. How can your squad best utilize them on a grand scale? What is the best way for your squad to be successful? The choice between horizontal and vertical stack, zone or man defense , or handler-strong versus cutter-strong sets may appear arbitrary, but veteran players know it makes a key difference in the season. By selecting the set as a leader, you are pointing your team in a very important direction which they will run full speed ahead. Every team needs goals, the more specific or SMART, the better. Your team and your players should constantly have goals for their own improvement, and each and every goal should be approved by a captain or coach. Monitoring and then redirecting those goals is once again charting a clear map for your players to follow, the most essential aspect of being a leader. If the pre-season is the leader’s high point for planning, then in-season or in-tournament moments can at times be the captain’s or coach’s most frustrating, caught on the sideline watching, most of the power out of their hands. A smaller version of roster selection, it’s another underrated and often rushed way for a leader to influence a squad. Set and pick deliberate lines; having them thought out beforehand (for several situations) is essential, and making sure they are balanced and strong is your job. In the middle of tournaments or games, it can often feel like an on-the-fly decision, or even a battle between players for playing time. Have notes and a schedule for lines laid out; ideally be able to call people in groups (O1, O2, D1, D2, Z1, etc.) rather than individuals and keep track of how often each line plays and is successful. Then be ready to change between games if necessary. Communicate your line calling strategy in advance to get everyone on the same page. Once again, a leader often can’t completely carry the team once it is on the field. So guidance and direction are paramount. Having your team run set plays on offense is a good starting point, at the very least for what you think will best be accomplished once the game starts. Likewise, the defenses and offenses you run, based on the competition, are about sorting and shifting your players into the best situations. Use the same reflecting questions above on the enemy: find the opponent’s weaknesses and strengths, counter them with your own team’s abilities, and allow your team to then go out and play. Don’t be rigid. If something is working, then don’t mess with it. If you’re not finding success with a specific strategy, be willing to be flexible and try something new. Never lose a game playing the same strategy over and over. The timeout is the one way a coach or captain can literally stop the action on the field, hit pause on the game, and call for a change. Using timeouts should be just as strategic as using your plays or sets. They are a valuable resource that should be neither wasted nor forgotten. Practice using timeouts during the regular season as a leader with your team and come prepared with plays, sets, and ideas that can run best off a timeout in a variety of situations. The final critical skill of the battlefield general is the rousing speech. As a team leader, you have the power of voice in the huddle to critique, recommend, and fire up. It’s a quality that is hard to describe and harder to teach, but finding the right tone of motivation for your team as a leader, although it depends on a variety of factors, can be a really powerful tool. One element of a good huddle speech is a focus on the details. What strategies are being run? What is being changed or focused on at a particular moment in a game? Who is matching up with whom? Another element is strictly motivation. It’s going to matter what your personality is and the manner of your team for whether your job is to keep them fun and relaxed or to give a rousing speech that belongs in Shakespeare’s Henry V’s Band of Brothers. Regardless, don’t be silent — the team will be looking to you. Your words will matter most and be what they are thinking on in the critical moments. Unless your team has reached or exceeded every goal by the season’s end, at the end of the year your job as a leader shifts from active guide, to objective critic. Unless you’ve won the national championship, it’s always important to have a cold, calculated look at the season. Examine the strengths and successes, make sure they are praised, noted, and saved for next year. But also take the cold scalpel to the season and find what went wrong. It can be an extremely touchy subject, depending on how the season ended, and is many times skipped due to lack of time or energy, especially on the college level with summer departures. But don’t waste this important chance to reflect, as it’ll be the best one you ever have. Have a system and an agenda for going into this. A meeting might be the best course of action, but no gathering should take place without some ground rules. Just like the season, it’ll be your job to set the community norms. First, give your team some time off to grieve or celebrate (or both). Let the team use this time to either relax and step away from the season or to think individually on what went wrong (or both). If you do have a meeting, have an agenda and keep it focused. An open-air, intoxicated, blow-out session might sound like a good idea, but isn’t likely the most constructive way to improve for next year. Sometimes the autopsy meeting is best without, or at least partially separated from, a large team gathering or party. Let each person state what they thought went well and what they thought went wrong. Keep a running list, and then plan for ways to improve. Make sure everything is noted; people shouldn’t be harboring doubts that carry over into next season’s planning or roster. Be self-critical as well, and encourage players to do the same. Everyone has ways to improve. In the end, the leadership group cycle will begin again: asking questions, making plans, and starting the pre-season cycle before you know it. The leader’s job is never finished, but if done right, it can make a big impact. 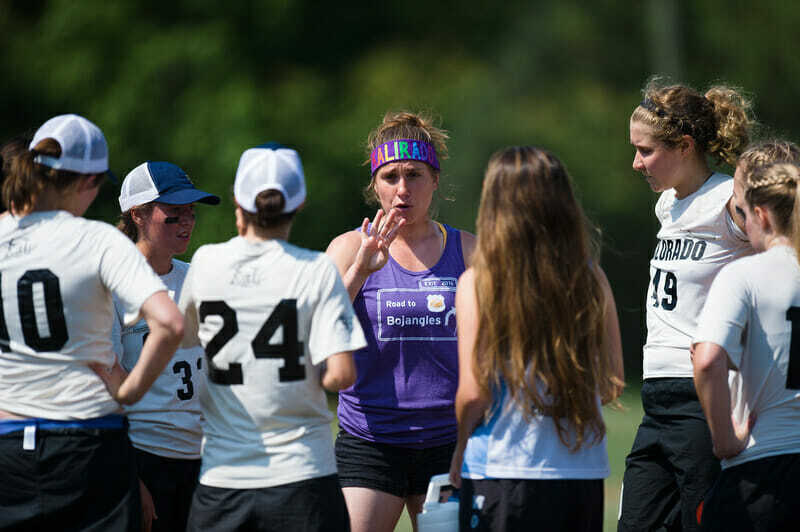 Comments on "Tuesday Tips: How A Coach Or Captain Can Impact A Team, Presented By Spin Ultimate"